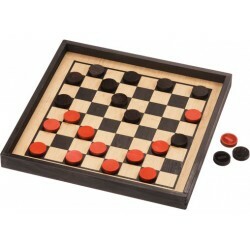 Our Basic Checker Set includes our basic checker board and 24 plain wooden checkers. The checker boa.. Cowboy Checkers? Nine Men's Morris? Don't know either name? Well trust us, it is a fun game with a l..
Our Basic Player's Choice Checker Set includes our basic checker board and 24 wooden checkers. The c..
Our Premium Player's Choice Checker Set includes our premium checker board and 24 wooden checkers. T.. Combine our Premium Checker Board with black red crown checkers and you have our Premium Crown Check.. Combine our Premium Checker Board with black engine and red caboose checkers and you have our Premiu..
Crafted from hard maple with a durable clear lacquer finish. This conventional round board measures ..
Perhaps the most beautiful wooden Chinese Checkers game made in the USA. Crafted from solid cherry w..
Our Two Player Chinese Checkers board is a little different and a lot special. The game play is the ..